How will you know when to buy and sell? Should you own Gold and Silver? Following its 45% fall from grace last year, Apple has been on the rebound since printing its 385.10 low in April 2013. Since then, despite rallying more than 38%, and retracing nearly 62% of its bearish decline, the stock price remains almost 200-pts away from its all time high. 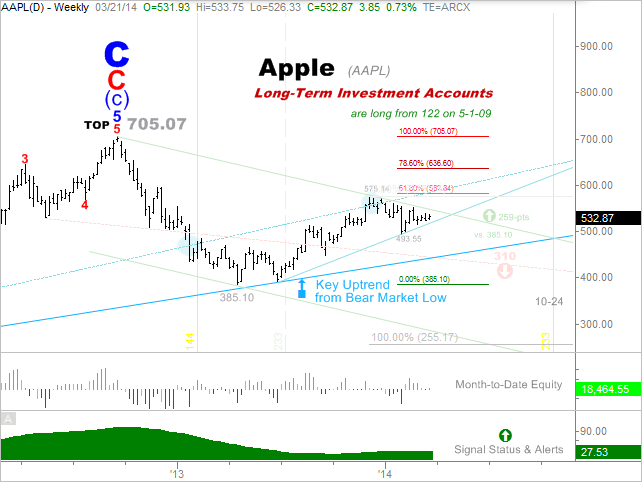 Technically, Apple’s larger secular trend remains bullish; its cyclical trend from the 705 top remains down, its medium-term trend from the 385 low remains up, while Apple’s short-term trend from the more recent crest at 575 remains sideways with a downside bias. On the bullish side of the equation, so long as 385.10 holds pivot low, a breakout and sustained trade above the topside of the downtrend channel shown, will ignite a buy trigger promising in excess of 250-pts in upside to fresh historic highs. From an Elliott Wave perspective, if Apple is able to achieve new highs, the Cycle degree “C” wave noted at the 705 crest will become highly suspect. In contrast, failure to reclaim and sustain trade above 583 in the coming weeks has the technical potential to usher in another large leg down equal to the last, citing a downside price objective near 255. If the corrective rally from the 385 base is over, an imminent and sharp 3rd or C-wave decline is primed to unfold. As long as 705.07 holds high, a breach of the key uptrend drawn from the 2009 bear market low will likely bring about a move to the standing target noted at 310. We’ll also be looking for the next key pivot high/low of plausible import toward the latter part of October 2014. The Chart Cast Pilot and Elliott Wave Technology’s Guardian Revere Long-Term Trend Monitor are the proud sponsors of the preceding post. You've been PUNK’D - What are you gonna do about it? Money and the Universe from Nothing: Is it Right? Copyright © 2017 Elliott Wave Technology. Powered by Blogger.